In September of 2008, Kelly Hart relocated from Idaho to Bellingham to become the Executive Director for Allied Arts of Whatcom County. She brings over 20 years of experience working in for-profit and non-profit arts organizations. Her wealth of knowledge and abilities are related to the incorporation of the arts into cultural tourism and in community development through programs such as promotion of the public arts. Kelly has served as a member at large for the Idaho Commission on the Arts, Bellingham Tourism Commission and Washington State Arts Alliance. 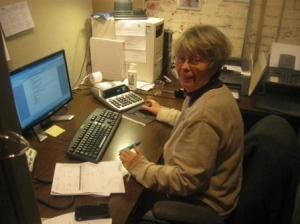 We have lost count of how many years Judy has been involved with bookkeeping for the organization. She has been a vital component in the coordination of our Holiday Festival of the Arts and Chalk Art Fest. Katy started out as a volunteer and was hired on when we realized what a great asset she was to the organization. She oversees the programs that promote retail art sales such as our rotating gallery exhibits and the booth coordination for our two festivals. Scott has been a professional artist since 1999. His oil paintings and illustrations have appeared in venues across the country. Prior to moving to Bellingham in 2016, he served as Director of Community Life for Magnolia UCC, President of Magnolia Chamber of Commerce and founder of Magnolia Art Experience. Presently, he is the Executive Director of the Historic Fairhaven Association, sits on the COB Tourism Commission, directs the a cappella group One Accord, and co-owns Current and Furbish in Fairhaven with his partner Cameron. And somehow he still finds time to paint! Rachel has been an Art Educator for 10 years, currently a business owner of Rachel’s Whimsical Arts, and a Professional Artist for 12 years. A local to Bellingham, WA, she’s lived here since she was a child, and has traveled across the PNW and abroad to Europe, which gives her a diverse experience in global cultures and art. While she was a student at Whatcom Community College (2007-2010) and at Western Washington University (2007-2013), she volunteered with Allied Arts, and worked with the Children’s Art Walk. She’s also been head chair of the Queer Straight Alliance at WCC while she was a student, helped create their drag show, and put on fundraisers. Many other volunteering experiences have been a part of her life, such as Bellingham Pride, the Bellingham Roller Betties, fundraisers, and community based art projects and art shows. Rachel is passionate about the arts, artists, art education, and the community. Colleen Harper is a multimedia artist who dabbles in costume design, watercolors, jewelry and poetry among other creative endeavors. 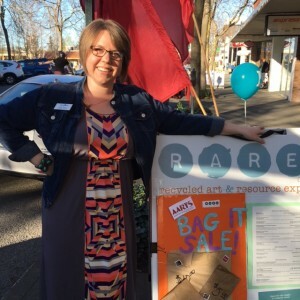 She is Vice Chair of the Ferndale Arts Commission and has worked to facilitate community projects including Bellingham Tweed Ride, Ferndale and Bellingham mural projects, and Commercial Street Night Market. Bringing community together through art and creativity has been the focus of her volunteer efforts for more than 10 years. Alexandra’s core belief is that everyone deserves beauty, everyone can be creative. She has a long history of volunteering in the Bellingham Arts scene, beginning at the turn of the century joining the Bellingham Arts Commission as a mayoral appointee serving through 2016. She served the board of the Whatcom Museum Society for 2 ½ terms during which the Lightcatcher Building developed from dream to reality. Simultaneously she served on the Whatcom Community Foundation Investment and Finance Committee and delved into the management of nonprofit funds. Later, she served as Treasurer for Kulshan Community Land Trust, and is a former board member of the Downtown Bellingham Partnership. She joins the board to advance the efforts of AAWC for everyone in the community. 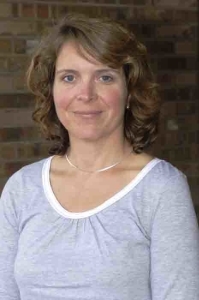 Jena moved to Bellingham in 1985, and shortly after began working for Bellingham National Bank. She continued in the banking industry for another 30 years and became involved with her community by serving on such non-profit board of directors including President of the Skagit Women’s Alliance and Network. She currently serves as the Treasurer for the Downtown Bellingham Partnership and is a member of the historical preservation committee. Jena became interested in the arts and historic buildings downtown Bellingham when she started working for Daylight Properties. Jena loves having such a diverse group of local artists who are readily available near Downtown Bellingham. Dragon Wood Design – Designer. Sheri Clark has been a successful artisan at various craft shows for many years. Her background in Chainmaille comes from several private sources learned many years ago. She enjoys working with all types of metal using various techniques and mediums. She is one of the founding members and a past officer of the board of Directors at the Bellingham Metal Arts Guild. This lady has an unlimited amount of patience. understanding or feeling you have within yourself. To grow a healthy, innovative community we need to have an environment and activities that inspire and feed the soul. My strengths include passion, optimistic perseverance, and open heart and mind, and a driving desire to understand. I am not sure but I can call expertise, but as an RN I have skills and collaboration, program/system assessment and evaluation, and program/educational course design. Alan is a Technical Generalist with a lifelong interest in all types of Art and Puppetry. In current decades Animatronics, Kinetics, Robotics, Special Effects and Electronics have been added to the mix. He was a collector of notable art and has always supported Art & Music in schools and the community. His current interests at his studio lay in creating examples of how to recycle packaging and other items into art projects for adults and children, along with developing community oriented projects. Alan is on the Board and a Past President of the Bellingham Metal Arts guild, involved in the local Steampunk community and has founded and /or served on Boards for Technical Incubators, Performing Arts, and Social & Environmental Issues.